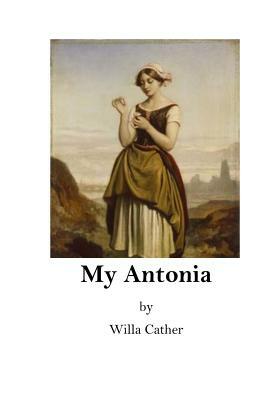 My ntonia (pronounced with the accent on the first syllable of " ntonia") is a novel published in 1918 by American writer Willa Cather, considered one of her greatest works. It is the final book of her "prairie trilogy" of novels, preceded by O Pioneers and The Song of the Lark. The American frontier comprises the geography, history, folklore, and cultural expression of life in the forward wave of American westward expansion that began with English colonial settlements in the early 17th century and ended with the admission of the last mainland territories as states in the early 20th century. Enormous popular attention in the media focuses on the Western United States in the second half of the nineteenth century, a period sometimes called the Old West, or the Wild West. Western fiction is a genre of literature set in the American Old West frontier and typically set from the late eighteenth to the late nineteenth century. Well-known writers of Western fiction include Zane Grey from the early 1900s and Louis L'Amour from the mid 20th century. The genre peaked around the early 1960s, largely due to the popularity of televised Westerns such as Bonanza. Readership began to drop off in the mid- to late 1970s and has reached a new low in the 2000s. Most bookstores, outside of a few west American states, only carry a small number of Western fiction books.